Game 8: At Ease Games Final League Battle! | 30mm Madness! Game 8: At Ease Games Final League Battle! 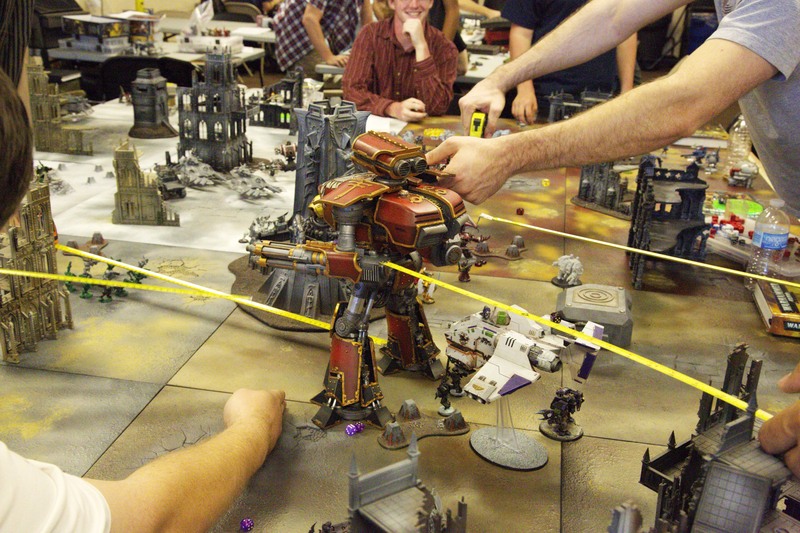 And I (sort of) fielded the reaver titan Saevus Verum!!! While my 1500 points of blood angels faired poorly… Mostly do some very effective Dark Eldar (Allen!) dropping in on my flank and punching lots of painful, nasty holes in my army in the first two turns… my Reaver Titan walked the battlefield!! W00t!!! Our tournament organizer, Josh, controlled the Reaver at the end of each turn (after all other 8+ players resolved their player turns). It was fun putting the apoc barrage template down… while it did do lots of damage, the dice rolls definitely still matter and many of the troops/squads targeted were remarkably resilient to the apocalypse missile launcher. On the bottom of turn 4 or 5 (I’m not sure as I was tabled at the bottom of 3), Saevus Verum was finally reduced to 0 hull points and Josh rolled a ‘6’ on the catastrophic damage table… BOOOM!!! reactor meltdown = 6xD6 strength ‘D’ AP2 hit. This was especially brutal on the two blood angels players who had lots of troops near the Titan (I feel slightly bad, but what a great narrative!!!). Folks measuring out…24″ (if I remember correctly) from the Titan to see who got hit by the reactor meltdown. This entry was posted on July 8, 2012 by justinhardin. It was filed under Battle Reports, Warhammer 40K .